We can say that, India and incense sticks share an age old relationship. India is a religious country and there are hardly any or rather no festival or religious occasions celebrated without the use of Mystical incenses sticks. 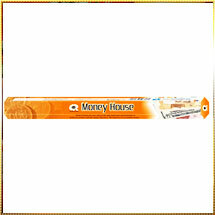 Here our Money House incenses sticks are made of aromatic plants (dried up leaves mixed with essential oils) which release fragrance when burned. Generally, it is used in religious ceremonies/rituals, aromatic therapies and meditational purposes. They are even used to create spiritual ambiance and to remove bad odour.